I’m pretty excited about today’s post and giveaway, it’s my biggest giveaway I’ve had here on the blog and it’s for a product I love and have been using for a long time. I’m asked often about what kind of nonstick skillets I use and over the years, I can tell you, I’ve gone through quite a few and have stuck with Calphalon for as long as I can remember now. I think it’s safe to say that my family uses our nonstick skillets almost daily. My husband is always cooking up eggs for us for breakfast, and I like to use them for frittatas, fish and quick vegetable sautes. Since I’m usually trying to keep the amount of oil and butter I use to a minimum, a good nonstick skillet is something I really depend on in my cooking. Fish is something I cook for my family usually a couple of times a week. I tend to broil salmon, but I really like pan frying seasoned white fish, like flounder or tilapia, for quick weeknight meals. It cooks up in just minutes and is perfect alongside veggies, over a salad or in a sandwich like the one I’m sharing with you today. Using a nonstick skillet like this Calphalon Unison one really cuts down on the amount of oil you have to use to get a nicely seared piece of fish. 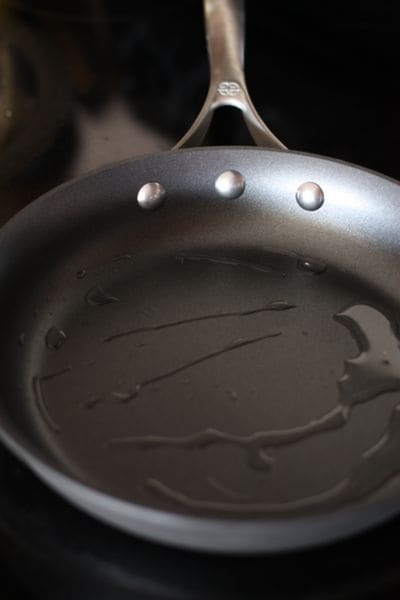 I only use about a 1/2 – 1 teaspoon each time I cook in my nonstick skillet and the food literally just slides out of the pan and onto your plate. Literally. 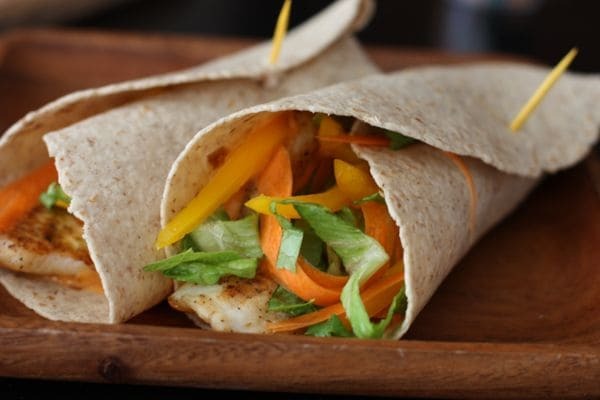 These Spicy Fish Wraps are perfect for when you are looking for something quick and light to make for lunch or dinner. 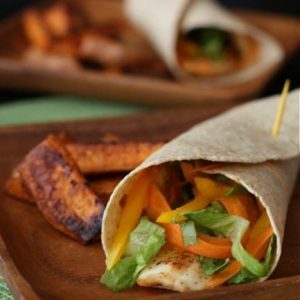 All you need is a few ingredients – wraps, fresh veggies and fish – along with some kicked up mayo, and you’ve got yourself a meal you could feel good about. I always love a good fish sandwich but sometimes I really just don’t want to feel heavy after eating a big piece of bread. I opted to use whole wheat wraps to keep things lighter – and because whole wheat wraps tend to be full of protein and fiber, you still feel full and satisfied. You can customize these wraps however you’d like. I used regular seafood seasoning this time around, but I love blackened fish so next time I make them I’ll use my favorite blackening seasoning instead. I served them alongside some roasted sweet potatoes, but they would be also great with some slaw or baked chips. Prepare spicy mayonnaise first by combining ingredients in a small bowl, set aside. Prepare your fish seasoning by combining flour and seafood seasoning in a large plate. Take your fish fillets and gently pat until completely dry on both sides. Set aside until your pan is ready. Pre-heat your nonstick pan over medium-high heat. When pan is hot, add your oil to pan and let heat up. You can test if its ready by sprinkling a small amount of flour mixture in oil, if it sizzles, it’s ready. Lightly coat your fish fillets in the flour and seasoning mixture, pressing down gently on both sides. Shake off any excess flour and place in your pan. Cook both fillets on bottom side for 2-3 minutes and carefully flip. Cook for about another 2 minutes or until browned on both sides. Carefully slide your fish onto a plate and set aside. 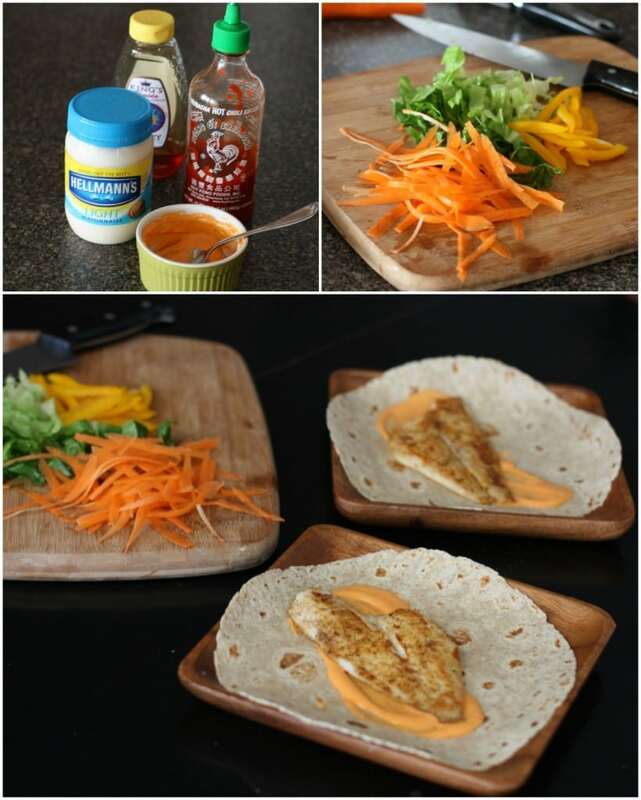 Begin to assemble your wraps by spreading the spicy mayo on wrap, then topping with fish fillet and your veggies. Flip up bottom third of wrap, then pull in both sides into middle to turn into a “sandwich”. You can keep your kicked up mayonnaise simple and spicy by just using sriracha and mayonnaise. I mellowed out the kick (but kept the flavor) by adding a little drip of honey and splash of vinegar. The choice is yours. I’ve partnered up with Calphalon for the launch of their new Your Set site – a place where you can create your own unique cookware set based on your personal cooking style. Instead of purchasing pre-packaged sets, you are basically building your own mix and match set with your cooking needs in mind by choosing between Calphalon’s premium lines of cookware, Unison Nonstick and AccuCore Stainless Steel. Go check it out and play around. Pretty cool if you ask me. As part of the new Your Set site launch, Calphalon is generously offering one of my readers a chance to win a $500 Calphalon Gift Card. Leave a comment on this post. If you already have a favorite Calphalon product you use, please share! 5. Share about giveaway on Facebook with link to this post. 7. Subscribe to Aggie’s Kitchen RSS feed. Love the spicy mayo sauce!! I followed Calphalon on Twitter. I love my calphalon! I only have one of their pans, it’s a big 10qut dutch oven type pan. I use it all the time. If I had to take one pan with me it would be that pan! I already like you on Facebook. thanks for the awesome giveaway! YEysyeyseysyeyseysyes! I only use Calphalon AND I need a new little non steek. Can I have it? Coo, coo. Great pans…thank you for the chance! Awesome giveaway! I don’t have any calphalon pans but would be thrilled to win some! I’ve had a set of Calphalon for over 15 years. They have great customer service! I am a happy follower of Aggie’s Kitchen. AWESOME giveaway! I only have one Calphalon pan but it is one of my favorites! I also have a Calphalon baking set which I adore. Love the fish tacos, they remind me of summer! I am subscribed to your RSS of course! I have the 8″ skillet that I use everyday! I have a Calphalon sauce pan my sister gave me years ago. I love that pan. I desperately need some new cookware! Thanks for the offer. I was just telling someone how my current pots and pans need to be retired, this is a prefect giveaway! I already like Calphalon on Facebook. What a great giveaway! I wish I was back home so I had a chance to win. 🙂 The fish looks great too! This looks delish Agg’s- looks like something even I can make! Love Calphalon, great post! Will be trying these with a chunk of fresh Halibut very soon. Tweeted, have a Happy Thanksgiving! Great pans – great prize! I use their bread pan and love it. WooHoo, I would love to win this Calphalon gift card because I have never been fortunate enough to be able to afford to purchase any myself but I know it is fantastic cook wear. I love all things Calphalon! I subscribe to your RSS! I like calphalon on FB! Wow, what a great giveaway and those fish tacos looks so easy but so tasty! I follow you on Twitter. Oops spaz. I meant to write that your blog is in my RSS feed. ha! I subscribe to Aggie’s Kitchen in my feed. Wow, this is an amazing giveaway! Thank you so much! I have a huge I think it’s a 8qt soup pot that I use to make chili and when I get done the chili goes to the rim of this pot. I love it! I love calphalon — my friend has a dutch oven type pot that I covet – but I’m not sure what size it is – I just love the shape and style of it. I am a fan of Aggie’s Kitchen on Facebook. I am a fan of Calphalon on Facebook. Thank you for the wonderful giveaway! I do not own any Calphalon, but I would love to someday. I like Calphalon on Facebook. Thanks! I like Aggie’s Kitchen on Facebook. Thanks! I have a small baking pan from them that I love. I have never tried Calphalon cookware, but would love to. I must say that your fish looks amazing! I do not have any Caphalon pans, but have herd rave reviews on them! I have a Calphalon skillet that we got as a wedding gift that I love! I don’t know what it’s called, but it is great. I’m a fan of Calphalon on Facebook now! I am in desperate need of new pans!!! I would love to try out Caphalon! I have one Calphalon frying and I love it. Would love to have more. Thanks for the giveaway. I got a Calphalon saucepan for my wedding–it’s amazing! Sriracha mayonnaise is my favorite, these look amazing, Aggie! I love Calphalon products, my favorite is my waffle iron! Hi! My favorite is the omelet pan…perfect for eggs! I like aggies kitchen on face book. The large saute pan is my favorite piece! I am a RSS subscriber. Google Reader. I love my Calphalon egg pan. I don’t own Calphalon products, but I would love to. Thanks! My husband would love these wraps! He’s the fish lover in this house. And I seriously adore Calphalon non-stick skillets. They’re a dream to work with and clean up! My favorite Calphalon pans are the omelet & saute pans 🙂 I use them daily! I Like” Calphalon on Facebook. I “Like” Aggie’s Kitchen on Facebook. I would love to sink my teeth into one of those fish wraps! So delicious! I follow AK on facebook. I love my calphalon skillets! These wraps look awesome, Aggie!! I have a small omelet pan that I love! “Like” Aggie’s Kitchen on Facebook. Subscribe to Aggie’s Kitchen RSS feed. I have several Calphalon skillets. Finally got covers for all of them Love them. Saladgoddess following Calphalon on Twitter. Fish wraps/tacos are such a great week night dinner. Can’t wait to try these. Love the calphalon grill pan! Thank you so much for the chance! I love their frying pans — great quality! Using a good pan makes all the difference in the world! I don’t have any calphalon pans but boy would I love some!! I like Calphalon on fb as Dee G.
I once had a Calphalon grill pan that I loved. I wasn’t the best of cooks back then and sadly no longer have the pan. I’m a google RSS subscriber. I have two nonstick Calphalon pans that I love to use!!! I ‘Like’ Calphalon on Face Book. I ‘Like’ Aggie on Face Book. I subscribe to Aggie’s online/website RSS feed on Google. Oh, how I would love to own a set of Calphalon pans! I “Like” Calphalon on Facebook. I love my nonstick calphalon pan, but it’s only 8″. I larger one would be perfect! Nothing sticks to this pan! I love the spicy mayo here! I follow you on fb and also subscribe via rss! What an awesome giveaway. I love calphalon pans although I don’t have any myself. I’ve used them though. They are fantastic! I would love to try Calphalon. I already like Aggie’s Kitchen on FB. I subscribe to your blog by email. This recipe sounds great. I have one of their flat bottom woks which I love. I reach for my capahlon saute / omelet pan most mornings! Love it! Just ‘liked’ you on FB. Is it terrible that I love both mayonnaise and sriracha. I slather it on a lot of dishes. I follow you on twitter! I don’t already have a fav item but I’d love to win that card find one! Or many. Thx for the chance – great giveaway!! I am a subscriber to Aggie’s Kitchen. I subscribe to Aggie’s Kitchen via email. I love Calphalon stuff. I have a few pieces but could really use a lot more. I like Aggies Kitchen on Facebook. I follow Aggies Kitchen on Twitter. I have a 12 inch Calphalon skillet I use all the time and love! I liked Aggie’s Kitchen on facebook. I love their big non stick omelette pan! Also, I’ve liked both on fb and follow u on twitter too for extra entries! What a great giveaway, and what even better looking tacos!! I would love to win this giveaway. I could definitely use some new cookware. I have one Calphalon pan and I have to say it’s my favorite pan! I like Aggie’s Kitchen on Fb! I’ve never used any calphalon products…yet! ps. This recipe looks so good, I’m already looking forward to lunch now! I am so excited for this giveaway! Love your blog. already subscribed to your blog. I do not have a favorite Calphalon product mostly because I have never owned one. I would love to win this because I am moving to Europe in March as a missionary and as of right now, do not have a pots and pans set. This would be awesome! I now follow @AggiesKitchen on Twitter. I subscribed to Aggie’s Kitchen RSS feed. I would love to own Calphalon products! I love Calphalon! I have one of their griddles that I always use to make my french toast & pancakes. I use it all the time, almost daily, & it’s still going strong! oh what a fabulous recipe & giveaway! I think I’d love the Unison Nonstick-Sear 13″ Wok & Cover! I have a small non stick pan that is dedicated to eggs. LOVE IT! I have the whole set of calphalon non-stick pans and love them! That would just make my day to win the $500 Calphalon gift card. I love to cook and look forward to testing out my new cookware if I am soooooo lucky to win. I love the Spicy Fish Wraps recipe. Definitely going to try. I also enjoy receiving your blog via email. Thanks for offering such a great giveaway. I would love to win this gift card…yayyy! I would love some Calphalon products. I don’t own any calphalon products, but I’ve heard great things about them! Follow Calphalon on twitter @hewella1. My favorite Calphalon is my nonstick skillet. I follow Calphalon on Facebook. I follow Aggies Kitchen on Facebook. I’ve never owned a Calphalon product but I’ve heard nothing but great things about their products and from looking at their site they have a ton to choose from! I love my calphalon pancake griddle! I also follow you on FB as Floptimism! And I subscribe to your RSS feed! I don’t own any Calphalon products but I would really like to try them. thank you for chance to win! Great recipe, I just love fish. I could really go for one of these right now. Don’t enter me, I’m a Canuck. Love my Calphalon non-stick pans! I have a Calphalon non-stick frying pan! I love the egg pan, it cooks so evenly! i love the egg pan!!!! ease teach me how to use twitter someone!!!! Never tried a Calphaln product before but would really like to. Liked Angie’s Kitchen on Facebook. Love fish tacos, thanks for this recipe. I have a set of non-stick Calphalon pans that are in need of being replaced. I am going to switch over to stainless on the next go around. I was just thinking about what to have for lunch (before breakfast) and I will take 2 of these! I absolutely LOVE Calphalon products. They have the best quality and last a lifetime. I think I’d use their Unison Nonstick-Slide 12″ Omelette Pan the most. But all of their pots and pans are essential for anyone who likes to cook a lot, like myself! I’m a newlywed and just bought my first home with my husband, so this would be very nice to win. Have a wonderful thanksgiving. Thanks for the recipe, too! I subscribe to Aggies Kitchen via email feed. I was lucky enough to be gifted with some Calphalon bakeware several years ago. I have had such good results that I would love some of their cookware. Thanks for the giveaway! Happy Thanksgiving! I have several Calphalon skillets and love them all! Thanks for the giveaway! Love my Calphalon chefs pan–it is the old anodized style without the nonstick coating and seasoned to perfection! I subscribe to Aggie’s Kitchen RSS feed via email. 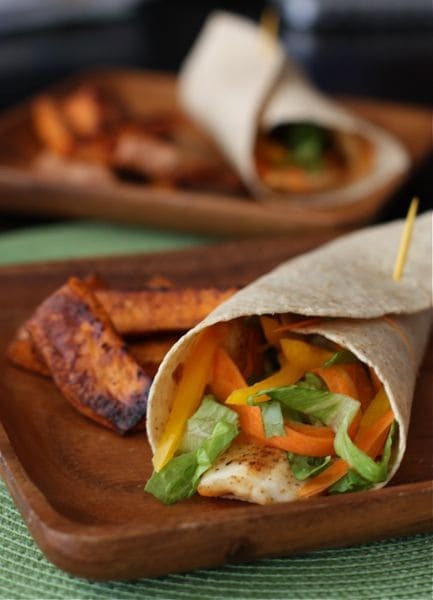 Can’t wait to try your Spicy Fish Wrap recipe…And thanks for an awesome giveaway opportunity! I love my Calphalon saute pan, we use it all the time! I have the 12-inch non-stick and love it! Thanks for the opportunity! I’ve always wanted some Calphalon cookware! I don’t own any Calphalon products.. I would love to give them a try! I also love how fast you can cook fish! I have all calphalon pans and love them all. I love anything Calphalon! Cooks everything wonderfully and cleans so well! I have a Calphalon chicken fryer pan that I love. I need some Calphalon pans! My cookware is getting worn and old! Already “Like” Calphalon on Facebook. Follow @AggiesKitchen on Twitter (@won2x). I like Calphalon on Facebook..Kenya G.
I liked Aggie’s Kitchen on Facebook..Kenya G.
I have one calphalon pot and I love it so much. I would love to have a whole set. I Tweeted about this giveaway: “I want to win a $500 @calphalon gift card from @aggieskitchen http://su.pr/419DdB #giveaway #yourset”. Love the fish taco recipe! I don’t have any Calphalon but would like to change that! I would love to win this. Calphalon makes some beautiful Stainless Steel Cookware. I liked Calphalon on Facebook (Aneesa Bint Lewis). I liked Angie’s Kitchen on Facebook (Aneesa Bint Lewis). I follow Aggie’s Kitchen on Twitter (@AneesaLewis1). I follow Calphalon on Twitter (@AneesaLewis1). I subscribed to your RSS feed via Google (Ummu Adillah). We love our set of kitchen knives! I “Like” Calphalon on Facebook! I Subscribe to Aggie’s Kitchen RSS feed! I have a ten inch coated skillet from Calphalon that I use often. I am one of your facebook followers. Rust Hawk. I am following Calphalon on facebook as Rust Hawk. I have an old Calphalon sauce pan that I love! I like Calphalon on facebook as Patricia Wojnar Crowley! I can’t tell which I’m drooling over more: those fish wraps or all the pretty Calphalon pots and pans! I also like Aggie’s Kitchen on Facebook! I’ve never used Calphalon so I’d love to try their AccuCore line as well as their Peach Melba Cobbler recipe. Cheers! I would love this giveaway I have never owned anything from Calphalon! Awesome giveaway, Aggie! We received some Calphalon pieces when we got married and love them. The huge soup pot and lid is one of my very favorites. I bought a beautiful Calphalon stainless steel turkey roasting pan last year and was so happy to pull it out of the cabinet again this year. It is one of my favorite kitchen items now. It’s the perfect size and such nice quality! I have a few pieces of Calphalon and am very pleased with their performance in my busy kitchen! I have a whole set of Calphalon, we cook with them every day and I will never turn back to using any thing else!!!! If we get this gift card, I’m getting Calphalon for my parents for Christmas!! I recently started using a Calphalon omelet pan and LOVE it — it’s so sturdy and well-made. Oh. My. Goodness. I LOVE the idea of My Set. I have my eye in particular on the Stainless Steel Roaster & Rack. Swoon. Thanks for the cool giveaway! That recipe looks delicious! There is a Calphalon pan that I want! winning this would make me happy as a clam! Ive been in serious need for new good pots and pans. I already “like” Aggie’s Kitchen on facebook. My favorite Calphalon products if my Calphalon turkey roaster. I have also put out a link on my Facebook page to this post! I do not own any Calphalon pan but would love to get a set….I hear its a great product!! :). Thank you! All my best pans are Caphalon……. My favorite Calphalon product is the everyday nonstick pan, I truly use it everyday!! I follow @aggieskitchen on twitter! I have a Calphalon Dutch Oven that I constantly use! I love it:) It’s definitely a workhorse in my kitchen. I like Aggie’s Kitchen on FB (Aimee Roberts Porter). I follow Aggie’s Kitchen on Twitter as menusmeals4moms. I follow Calphalon on Twitter as menusmeals4moms. I’ve never cooked with one, but I hear the Calphalon pots are the best! I do not have any calphalon, but I would love some! I CANNOT do without my Calphalon grill pan! It’s too cold to grill outside here in DC in the winter. I am following your RSS feed! I follow you on Twitter and Facebook as well. LOVE your blog. I haven’t used Calphalon products yet. That’s why I am entering your giveaway! Already on your RSS feed!!! I don’t have any Calphalon pans-yet- but I’ve used them at my parents’ and know they are of excellent quality. I follow Calphalon on Twitter. (I’m most creative1). I follow AggiesKitchen on Twitter. I’m mostcreative1. I don’t have any Calphalon product, so I hope I could win the giveaway. thank you. Love this simple recipe, made fish tacos for the first time with this! I only have one calphalon pan and use it every day! Would love to add to my “collection”. Thanks for the giveaway! This would be such a Merry Christmas!!! My pans are 30 years old!!! What a great giveaway…I would love to win this! I don’t have any Calphalon pans! I have their omelet pan, but would love to expand into more of their pans! Great giveaway! Did I mention those fish wraps look incredible! I need to make something like that for my family soon! Those fish wraps look amazing! 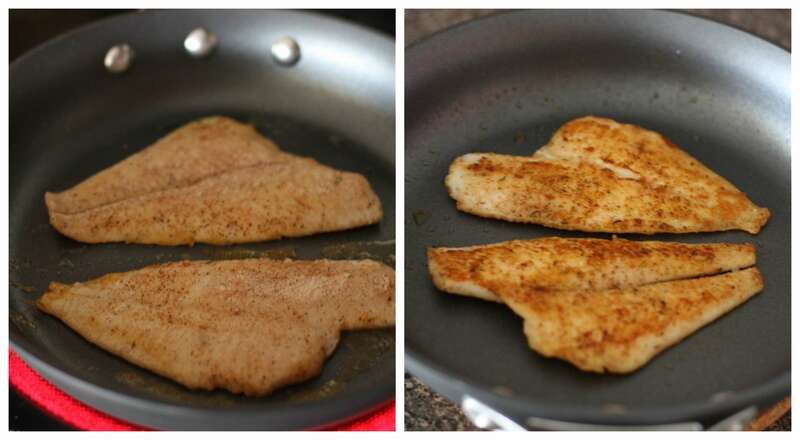 I will definitely have to give these a try, because we almost always have Tilapia fillets in the house. I love cooking with my nonstick skillet as well, it really does make cooking a simple pleasure. Thanks for sharing! I don’t own a Calphalon, but do need a pan desperately. Follow Aggie’s Kitchen on Twitter. I’m a fan of Aggie’s Kitchen on Facebook! I am subscribed to Aggie’s Kitchen. I own a Calphalon spatula….that’s it! This would be SO fantastic to win. LOVE my slide skillet in the bronze color. Would love me some Calphalon! Ready to win the pans! Thanks! I don’t own any Calphalon pans, but a need a new skillet badly. I would love to win! I would love my own calphalon pans! I do not have any Calphalon yet, reallllllly would love some! We have a wonderful, heavy Calphalon saucepan with steamer insert that we love to use for steaming artichokes! I’d love to replace my old cookware with some Calphalon! I bought a Calphalon set for my son, but I don’t have one yet! I haven’t had the opportunity to use any calphalon pans, but they are on my wish list. I wish I had a Calphalon set. I’m still using my parents leftover pots and pans from when I graduated and moved out of the house six years ago. Is eating the non-stick coating that’s chipping off the bottom healthy? I already have the Kitchen Essentials by Calphalon fry pan w/lid. It’s my absolute favorite!! Would love more! Love Calphalon——but I need to buy my youngest son a set of pots and pans !Pick me please! Plan to try this recipe, hadn’t thought of using coconut oil to cook fish. I like it. Would love to win some Calphalon cookware. I have a Calphalon stainless steel sauce pan but I could use some good nonstick for sure. I don’t have a nonstick pan of any stripe. As long as we’re talking Calphalon, let me recommend the excellent cookbook “Calphalon Cooks Weeknights.” It’s a keeper here. The Turkey Picadillo, for example, has become a favorite in more than one household in our circle of family and friends. The picadillo is flavorful, hard to mess up even when swapping out ingredients and changing amount of any given ingredient 🙂 – it freezes well, can serve with noodles or rice, over garlicky Texas Toast, cornbread, wrapped in a flour tortilla, or by itself (we have an Atkins dieter in our midst who enjoys it straight up). I signed up on Twitter to follow Aggie’s Kitchen. Would love to win the $500 gift card — and I DO very much enjoy your website. I added Calphalon to the Twitter accounts I follow – do I want to win? Yeahhh! Last of my entries for the gift card giveway. I subbed to your RSS feed. Have to say I don’t usually do the feeds and tweets and all that jazz, but you may have started something here … 🙂 I don’t have much time to explore such things but once in place, I can see they would be easy to use. (That being said, I’d much rather enjoy a leisurely browse right here at your site.) Thanks for offering us a chance to win some nice cookware. This is an awesome giveaway!! Thanks! I have a few Calphalon pots that my mom gave me and I love them! Like Aggie’s Kitchen on Facebook. Following Calphalon on Twitter as catholicfanatic. Following Aggie’s Kitchen on Twitter as catholicfanatic. I absolutely love Calphalon…awesome giveaway!!! I have a Calphalon ladle of all things, use it all the time, especially around this time of year with frequent soups! I follow AggiesKitchen via RSS feed. I like Calphalon on FB (Shannon Michelle). I follow Calphalon on twitter (@channynn). I follow Aggies Kitchen on twitter (@channynn). It would be amazing to own these awesome pans! We have a stockpot from Calphalon that we use quite frequently. Its a great size and weight. Thank you for the giveaway and the recipe. I was already planning fish tacos to use up some talapia we have in the freezer so I am really glad I stumbled upon this! Oh this would be so great to win! My pots and pans are soooo old, my pots aren’t even round any more… kinda oblong. lol. ty and good luck everyone! “Like” Aggie’s Kitchen on Facebook. Robin Phillips-Knotts is my id. ty! Follow Calphalon on Twitter – cokelush is my id. ty! Follow @AggiesKitchen on Twitter – @cokelush is my id. Subscribe to Aggie’s Kitchen RSS feed. via google reader at cokelush at gmail. I don’t own any Calphalon so I’ll be glad to win this. I have followed @aggieskitchen on twitter. I love your recipes!